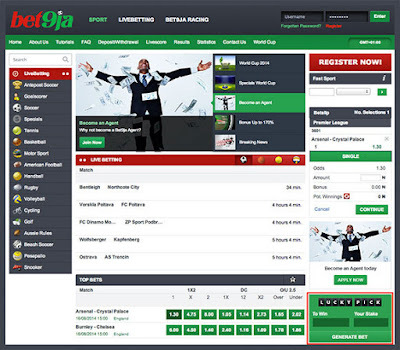 On the right handside of Bet9ja website you can find the option LUCKY PICK. LUCKY PICK is a smart solution to help you choose the bets that suit you most, saving your time. Simply insert the stake you wish to bet, for example 300 naira, put the amount you wish to win (for example -10 000 naira) and click on “GENERATE BET “. The system will automatically generate a coupon that corresponds with your criteria. Just click on Continue, make sure you are logged in to your account and the bet will be placed for you.